The lukewarm interest shown by many companies in entry-level foreign professionals is likely to cool even further, when they have to pay them higher salaries starting from next year. Employers told The Straits Times yesterday that the new minimum salary, which will rise from $3,000 to $3,300 in January, will make them think twice. "For a $3,300 pay, it makes more sense to hire a Singaporean fresh graduate than a foreigner. It is more likely that locals will stay on in Singapore and with the firm," said Rikvin recruitment consultancy manager Satish Bakhda. 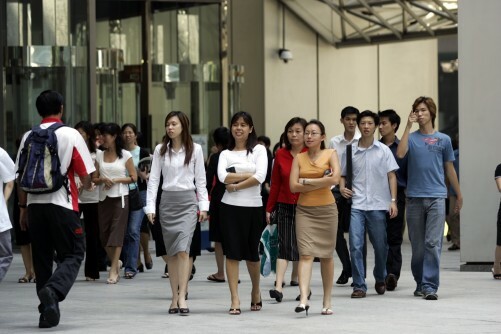 The Ministry of Manpower (MOM) announced on Monday the new salary benchmark alongside a framework to make firms consider Singaporeans first for professional, managerial and executive jobs before hiring foreigners. A key change is a new government-run jobs bank which takes effect next August. Companies have to run advertisements for at least 14 days before they can apply to MOM for an Employment Pass (EP) for a foreigner. Mr David Ang, associate director of human resource consultancy Remuneration Data Specialists, said the changes will not only ensure Singaporeans are considered first for all roles but will also increase their wages. "Firms should not have a problem about hiring locals if they offer salaries of $3,300," he said. As it is, bosses usually eschew fresh foreign graduates. They do not have proven track records, said employers and recruitment specialists. Companies said they usually hire EP holders who have at least three years of experience and command monthly salaries of about $4,000. The knock-on effect of the new ruling could be a boon for other foreigners, said analysts. Companies are likely to hire workers on the lower-tier S Passes instead. These are for mid-skilled workers earning at least $2,200 a month. Bosses also expect existing EP-holder employees to ask for higher pay now that the minimum salary has been raised. Mr George Wong, managing director of engineering firm Tec Revox, who employs two EP holders with salaries of $4,000, said: "I will probably have to raise the salaries of the experienced EP holders by 10 per cent. "But they will also have to take on more responsibilities to justify their higher pay." For the sectors which rely on entry-level foreigners, such as information technology, engineering and design, the fear is that the change will add to the labour crunch. They have to engage foreigners because there are not enough locals with the right skill sets or who want to do the job, they said. Association of Small and Medium Enterprises president Chan Chong Beng pointed out that these firms could still struggle to attract locals despite offering good salaries. "Not many Singaporeans want to do jobs with long hours or which require them to be on call any time of the day," he said. One employer who is finding it tough to hire locals is Mr Ko Chee Wah, chief executive of interior design and events company Cityneon. He is still hoping to employ more Singaporeans this year for roles such as designers and project managers. This will allow him to hire two EP holders, down from five a year. "Singaporeans are always my first choice. The problem is they may not want the job because of the long hours," said Mr Ko.